This article previously appeared on the blog of Downunder writer friend Dolly Garland and at Magical Words, a website of writing tips and publishing advice for aspiring novelists run by a group of top fantasy writers. And really, that is the reason. For me, it is all about the wonder. Fantasy can do anything, go anywhere, occur in any milieu. It can take place in your back yard, in the ancient past, on the moon, in another dimension—the nature and laws of which can be anything you imagine. It can be frightening, romantic, mysterious, filled with intriguing factoids. But there is one thing fantasy does better than any other genre, and that is wonder. Wonder is the sensation we feel when we suddenly discover that there is more to the world than we expected….and that this more is better, or at least more awe inspiring, than we had imagined. When this happens in real life—when we hold our infant son for the first time, or rush outside on our way to work to find a baby fawn, all wet and new, standing on our driveway, what is the first thing we always say when we describe the experience to someone else? I live in a world where there is wonder all around me, and no one else ever seems to notice it. Amazing things happen all the time. Once, I went to the Mall in Washington D.C. in hopes of meeting an author I particularly admired. It is rather a rare thing, to have an author one admires in town. By an even rarer quirk of coincidences, I found myself not in line with the hundreds of other people who were waiting for his signature, but standing next to him, talking to his daughter. There was a sprinkling of rain—which did not dismay his die hard fans in the least—and, when I turned around, a huge rainbow arched across the sky. But it was not just in the sky. From our position, it was coming out of the dome of the capital building! 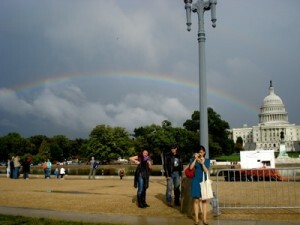 I had seldom seen a rainbow so clearly, much less one in so auspicious a place! (This was just at the very beginning of the bank crisis, while they were first discussing the bailout. I kept wanting to shout: “Hurry! Catch the Leprechaun! Grab the crock of gold!” ) Things like that just do not happen in real life. I have always wanted to have a daughter. I have also always wanted to adopt a child. When I was a teenager, I had friends who needed adopting, but no one wanted to take on children who were so old. Too much trouble. So that became one of my dreams, too: to adopt a teenager. I also wanted to be a writer. I have always wanted to tells stories. As a child, a group of adults who used to dress up as elves and kidnap their friends for fun once granted me the title “the Legendmaker,” because even way back then, everyone knew that was what I wanted to do. But wanting to write and succeeding are two different things. It took me nine years to finish my first novel and another six to sell it. By the time the book finally hit the shelves last summer, I had waited 17 years. Then, July 29th, 2009, a day I shall never forget, not if I lived for a thousand years, it actually happened. My book arrived! After all that time waiting, I held the beautiful volume in my hands. But it hardly mattered, because just a few hours before, my husband and I had grasped each other while we sent off the email saying, “Yes, we would like to be the parents to the thirteen year old girl who will lose her ability to have a family forever if she is not adopted before her fourteenth birthday in November.” With the return email, saying that our application was going forward, the picture of the beautiful Chinese girl we had received the day before suddenly became a picture of our daughter. For the first time, after waiting four years, we saw our daughter’s face. On the same day, I gained a book and a daughter! And that is why I write fantasy. Because I want to share that, to weave a tale of awe and enchantment so others can experience even a hint of the way I felt upon those two occasions. Because nothing is more like magic than magic itself. When you walk into your garden and discover that fairies really are living in your lily-of-the-valley; when you are taking a rest by a cool mountain river and you suddenly realize that what you had taken for an outcropping of rock is peering at you; when you come around what you thought was a familiar corner and catch elves dancing in the moonlight, that is fantasy at its best. When done right, it reminds us of those moments in our lives, those real moments, when the curtain of mundanity is pulled aside, and we see, not a little man from Kansas, but something vast and glorious that, if only for an instance, lifts us out of our every day life and into eternity. PS. Being an published author is a delightful thing…but being the mother of a teenage girl is even more wonderful. Life is filled with wonder every day.